The LARCH burner system has been especially designed b DAS Environmental Expert for the point-of-use treatment of waste gases from MOCVD processes in the LED industry. It is capable of treating large flows of hydrogen and ammonia as well as small flows of metal-organics and dopants. The treatment combination of oxidation und pyrolysis extends DAS´ technology portfolio in a sustainable way. Low investment and operating costs, a simple, robust design and low environmental impact (no CO2 emissions, minimum NOx emission) characterize LARCH. Current installations demonstrate maintenance intervals of more than six months. Maintenance access is possible from three sides. Operation costs and general safety can be optimized with a process tool interface. By the application of heat exchangers, the process gas heat can be used for other production areas. The system operates in three steps. Firstly, the process waste gases are introduced through a special packed inlet into the decomposition zone. There decomposition of Ammonia takes place. Subsequently the Hydrogen is electrically ignited and oxidized. 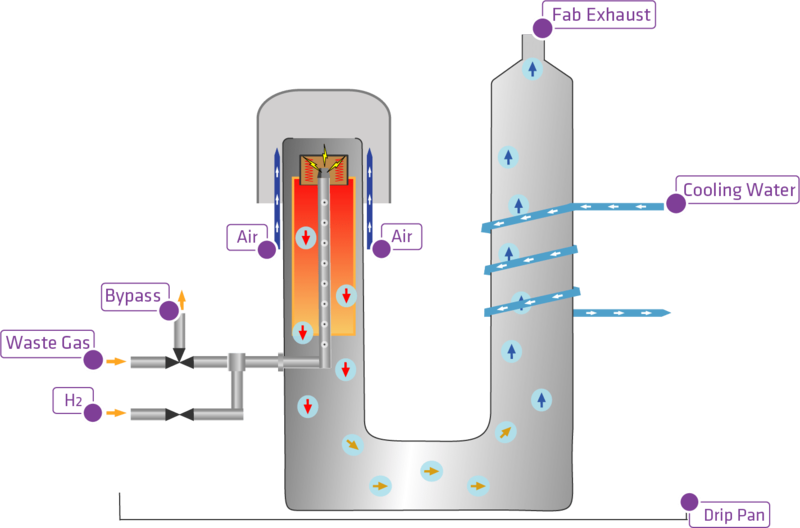 The waste gases are burned and oxidized within the reactor. Finally, the waste gases are cooled (< 60 °C) in a heat exchanger. They can be released into the environment without any further treatment as they meet the strict German standards for air pollution (TA Luft).